Its common knowledge that Aluminum (Al) conductors cost less than Copper (Cu). But how big is the difference in price? The answer may shock you. As PV module prices continue to fall, BOS components such as conductors become a larger portion of a solar project’s price, so it's a key area we value engineer. When looking at the a prices per foot for Al and Cu and the ampacity rating tables in the NEC, you notice the values aren’t linear or proportional, so it’s difficult to see what the practical difference in cost is. However, by combining all this information into a single value of $ per Amp, you can quickly see how it all fits together. As conductor size increases, the price of Cu quickly increases while the cost of Al is more flat. That means the savings of Al increases substantially with larger wire sizes. 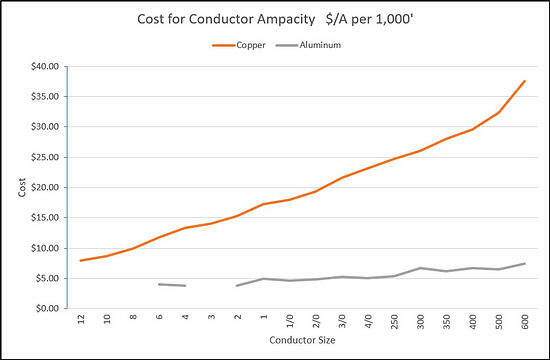 At lower conductor sizes, copper is twice as expensive as aluminum. 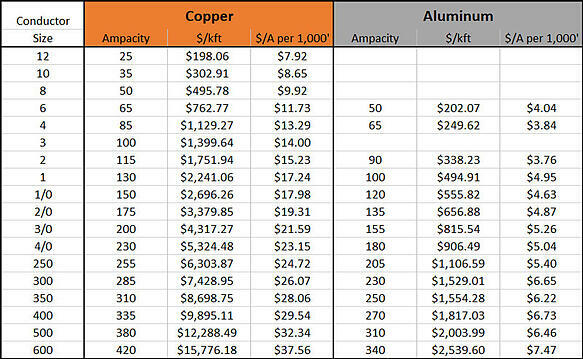 At the larger sizes, typically used in the commercial and utility scale projects we design, copper could cost 5X the price of aluminum. The cost of a feeder isn’t just the price of the conductors - you must also include conduit and labor. Aluminum often requires us to use a larger conduit and it takes a little more time to pull the larger wires and carefully terminate them, which are increased costs. However on a long run, the savings from Al conductors will easily cover the additional labor and conduit costs. Below is the table with the values in the graph above. The ampacity values come from Table 310.15(B)(16) in the 2017 NEC and the conductor prices come from the Southwire price sheet for THWN wire for May 2018. Then using basic arithmetic, we calculated the cost per amp for a 1000’ length of wire. Note: Pure Power Engineering doesn’t recommend using Aluminum conductors below #2 gauge (even though they are in the table & graph). Aluminum isn’t as ductile as copper, so smaller gauge wires are too easy to bend at a sharp angles, which damage the threads leading to arcing and failure. If you are looking for other ways to reduce the capital cost of your commercial or utility scale solar PV system, contact Pure Power Engineering to learn more about our value engineered designs and construction drawings.